In the days when Winston Churchill and Clement Attlee faced each other in the House of Commons, there was disagreement about whose hands should be on the Mace, the symbol of power at Westminster. Everyone assumed that the hands on the Mace would be British. In the past half century, the Prime Minister's power at Westminster has increased greatly, but it has diminished in the worlds beyond. In Westminster, the Prime Minister is now first without equal. But in councils of the European Union, he or she is only one among fifteen national leaders. 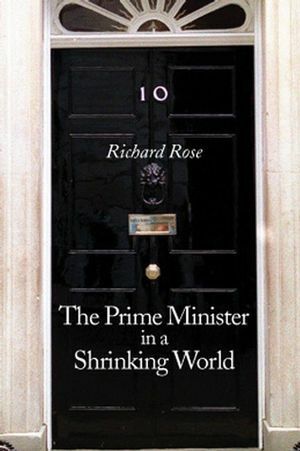 In a shrinking world the chief issues facing Downing Street today are 'intermestic', an amalgam of domestic politics and international concerns. Tony Blair may say that he is batting for Britain, but cricket skills are no match for an American president playing hard ball, and policy-making in the European Union is definitely not cricket. In an era of television politics, the faces and voices of Margaret Thatcher and Tony Blair are familiar to every voter, and the press cooperates in turning politicians into media celebrities. But what you see on the box is politics; it has little to do with the policies of British government. Old-school leaders such as Harold Macmillan devoted as much time to policy as to politics. But new-style prime ministers put politics first. Tony Blair wants to speak for all the British people, but the result is 'managed populism', for his voice travels down a one-way street. In Whitehall, Blair's Third Way blunts the cutting edge of policy, leaving officials puzzled about what to do when hard choices arise, especially about Europe. Anyone interested in politics and current affairs, whether a student or a thoughtful reader and viewer, will find insight and illumination in a book that draws on the author's unrivalled first-hand knowledge of British politics over the past half century. Richard Rose's work has been recognized by a lifetime achievement award from the Political Studies Association. He is a Fellow of the British Academy and director of the Centre for the Study of Public Policy at the University of Strathclyde. Richard Rose is Director of the Centre for the Study of Public Policy and Sixth Century Chair in Politics at the University of Aberdeen. He is a Fellow of the British Academy. Introduction: The Paradox of Power. 1. Looking After Number One at Number Ten. 2. Glendower in A Shrinking World. 3. What Makes Downing Street Change?. 4. Becoming and Remaining Party Leader. 5. From Private to Public Government. 7. Managing Parliament and Party. 8. Managing Colleagues and Bastards. 9. Running - and Running After- The Economy. 10. Managing Decline in a Shrinking World. 11. Tony Blair: A Populist Prime Minister. 12. What Comes After Blair?. Appendix A: Prime Ministers Since 1945. Appendix B: A Guide to Further Reading.